For those who are sticking around to play, Trion Worlds has enabled bonus experience, gold, gems, Enigma keys, and flower drops until the shutdown occurs on March 5 at 3:00 p.m. Pacific. Players can no longer purchase the Patron Pass, and anyone with a current subscription will have it renewed for no charge at its expiration. If you have credits sitting on your account, all items in the cash shop are 70% off. Alternatively, Trion is offering Devilian players the opportunity to transfer their credits to purchase items in the company’s other games. Qualifying accounts should receive an email from customer service within the week. It’s not too surprising to see Devilian shut down, as it was clearly the weakest of all of Trion’s offerings. 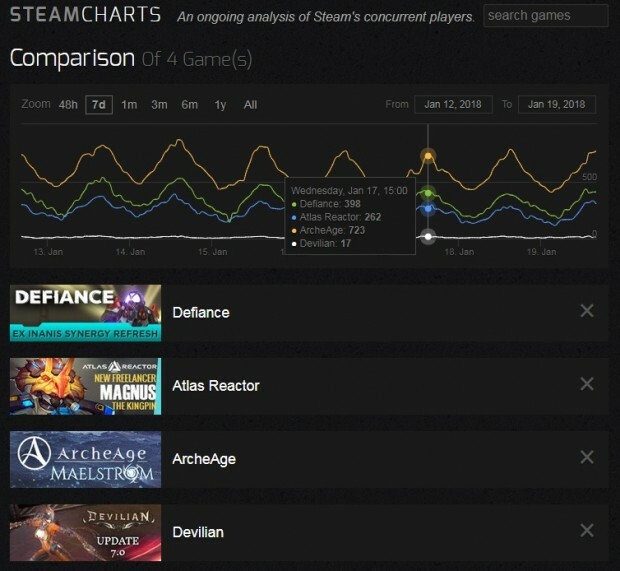 SteamCharts only lets you compare four games at a time; Trove is a clear #1 for the company, while Rift is at #2, slightly ahead of the #3-#5 games. So how does Devilian look? 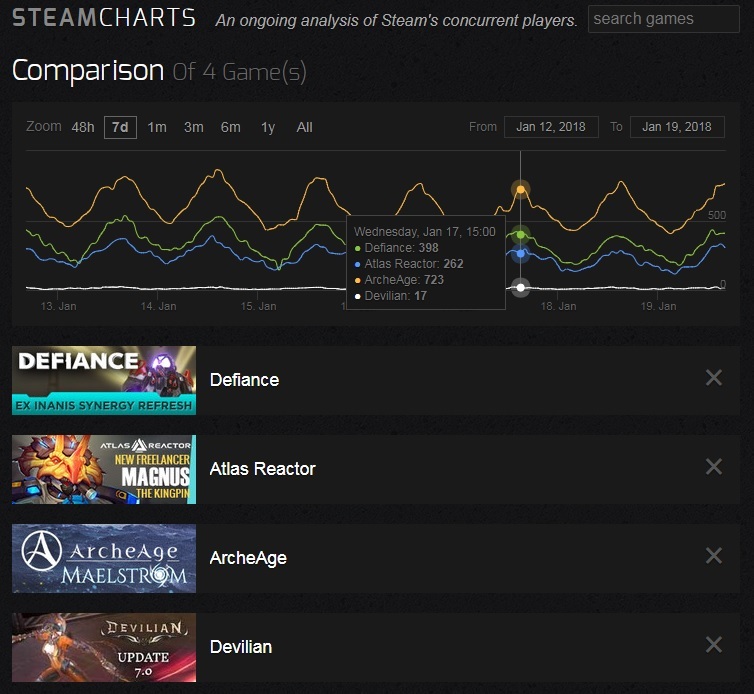 Yes, Trion Worlds has its own launcher that isn’t accounted for in these numbers, but if these numbers are even remotely indicative of Devilian’s population as compared to the rest of Trion’s games, its closure is a no-brainer. ty good whe have gta online 😀 id better play gta samp rather than this crapy games. The game wasn’t anything great to start.. It was mostly the same thing over and over again.. With a lot of limits on people who didn’t spend money on the game. Game was repetitive, boring, and didn’t bring anything new to the genre. Good riddance. Well, it had unbearable lag for most of the time I played it… I kind of enjoyed it in the beginning, though, before the lag. Well good bye Devilian online. well. its a good game however becomes an instant quitter for many players, including myself, due to the immediate grind-fest upon the end game. Yes, MMO can be grindy at times, but too much of grind like this one really isn’t worth the staying. I blame TRION for not overseeing this problem ahead of time instead blindly brought over a-typical eastern game over to the west with little or no modification for the western audience. This game had a potential to be fun and yet ruined by the publisher,like many of its predecessors. Or maybe it was meant for the cash grab from the start. Anyone of those games are in the red as the player base is pretty poor in all of them they are hanging by a shoe lace themselves. In regards to Trions launcher its the worse cpu eater ever & they got not brains to or intentions to fix it. I would of thought Trion would be the one to be shutdown. as its not the games fault its the companies handling and mismanagement of those games. Trion are just so lucky they grabbed a Minecraft clone to prop their backsides up but even thats not enough to help with the companies reputation in the game babysitting arena.